I feel compelled to mention this wonderful wine which I had at the Slow Wine Event two weeks ago today for the first time. It was truly memorable with the right amount of tannins and fruit, elegance and finesse. A perfect Barolo made with my favorite grape, Nebbiolo. 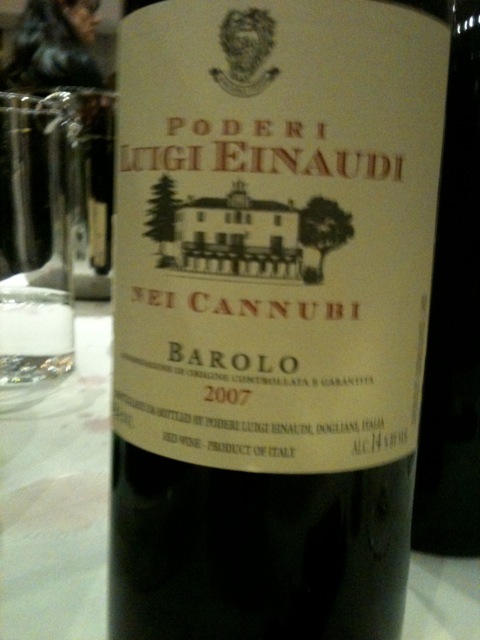 Poderi Luigi Einaudi is definitely a crowd pleaser and this wine was no exception. I also felt it was appropriate to speak about the winery. Luigi Einaudi was Italy’s first President. I am saddened by the news of the last hour that Moody’s has again downgraded Italy’s debt. Things just seem to go from bad to worse at times. Italian Prime Minister Mario Monti was just here in the US having very productive meetings with President Obama. This turn of events for Italy, Spain and others is a sad one. We were at the same event and somehow overlooked this one (so sad). But at the table right next to it, we found a couple of Barolos from Renato Ratti that are worth mentioning: The Barolo Marcenasco 2007 and the Barolo Rocche 2007– two gorgeous wines with intensity, licorice notes and dried fruit. Did you try these? I know those wines very well although not that vintage. Renato Ratti Barolos were my first entry into Barolo territory, wonderful back in 1998 and I am sure the same is true today. Thanks for commenting. 1998 was a magical year for Barolo, no? That was quite an introduction! You lead a Blessed Life, S! Sounds great! Have gotten to enjoy several Barolos this month, too, including a good one from 2007. Thanks for stopping by at Avvinare. Which Barolo 2007 did you try?